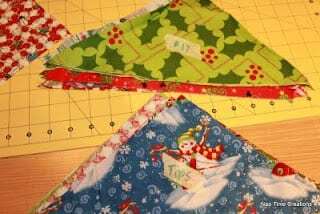 Today I’m sharing my free Paper Piecing Christmas Tree Skirt pattern and the tutorial so you can make your very own! 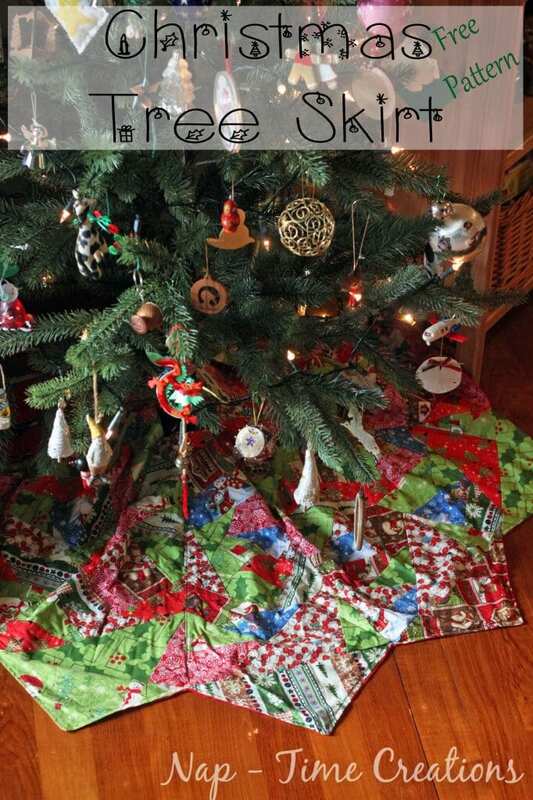 This Tree Skirt is quilted using the paper piecing method. It may take a few pieces to get used to it, but once you get going, this is a great way to make a creative quilt design! Click the video to get volume and hear the full tutorial. If the video doesn’t work try a different browser.. sometimes I can’t get the sound in chrome.. Also, if you are using an AD blocker you will not be able to see the video. Begin cutting the material. For the LARGE triangles (No. 17 and 19) I used the pattern and cute a triangle around 1/2 inch bigger than needed. 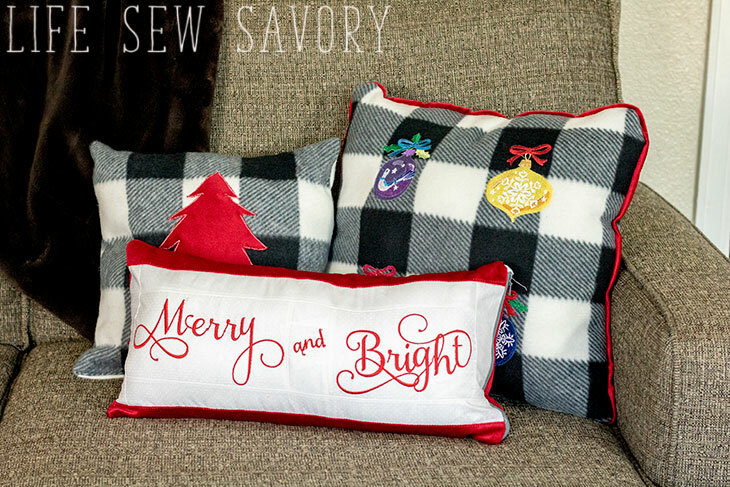 I used a variety of fabrics for both pieces to have options. For all the other pieces needed I cut strips of all the fabrics. Some 3inches wide and some 4 inches wide. This should cover all the other pattern pieces. You will cut the lengths later. Trace the printed pattern onto tissue paper. 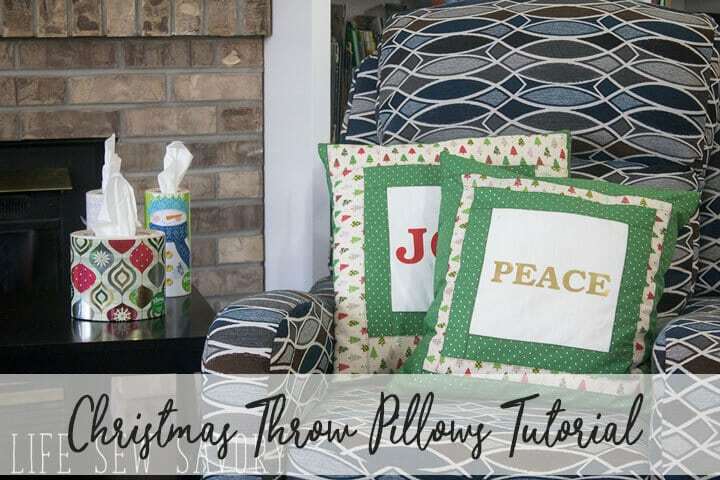 You can use an old pattern or just gift tissue paper (what I did). Turn the pattern over, so the numbers are backwards. Place your first piece of fabric (right side up facing you) over the # 1 pattern spot. Use fabric from your strips, just cut the length to fit. Make sure you have at least a 1/4 inch around all sides of the #1 piece. 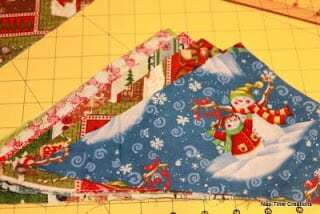 Take the fabric you are using for the #2 (make sure it has 1/4 allowance around all sides) and place right sides together on top of #1. I place one pin in the middle to keep everything in place. 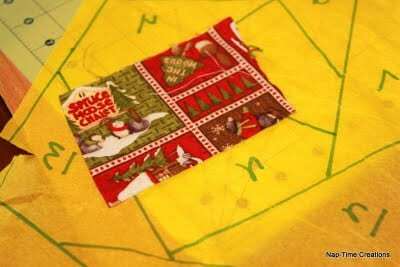 Now, turn the whole pattern over so the right side of the pattern is up, and sew on the line between the 1 and 2. Turn everything back over to the material side and iron open the seam. Step one done! **This is where your laminated card comes in handy. Turn the pattern back over (you will be flipping A LOT!) and place your card on the line where the next number (3) intersects with the numbers you just sewed (1 and 2). 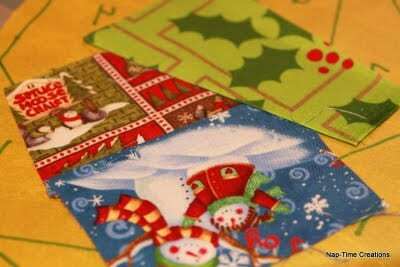 Fold the paper pattern back on the line with the card and hold it secure. Place your ruler which adds 1/4 inch over the card and hold. You an also just use your clear rotary ruler and put the 1/4″ mark on the tissue fold. Take your rotary cutter and cut off any fabric outside the ruler. This will leave a perfect 1/4 seam allowance for your next piece and get rid of the extra bulky material. When you unfold the pattern and turn back over, this is what you should now see. 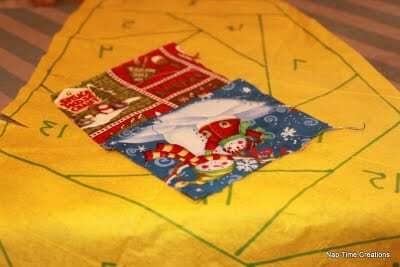 Place the third piece of fabric right sides together over the other two, so when sewn will cover the #3 place on the pattern. Iron open… AND REPEAT from the ** only this time you will cute between the 3 and 4. Here I have laid out all the panels to arrange the design. It was pretty random.. but just wanted to double check. I’ve removed one piece here so you can see the paper still on the back. This patchwork technique would be very useful for the participants in the challenge. Could I add a link to this tutorial so we could use it as a reference? The challenge occurs throughout September. 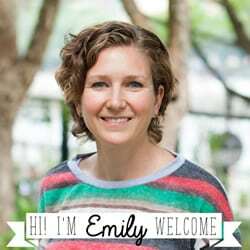 I hope you’ll consider joining us! BTW, I found you through the Creative Itch linky party. What a great project! Thanks for sharing. I might need to upgrade our ugly felt tree skirt into this beauty. This is incredible! Wow, you seriously put some time into this! 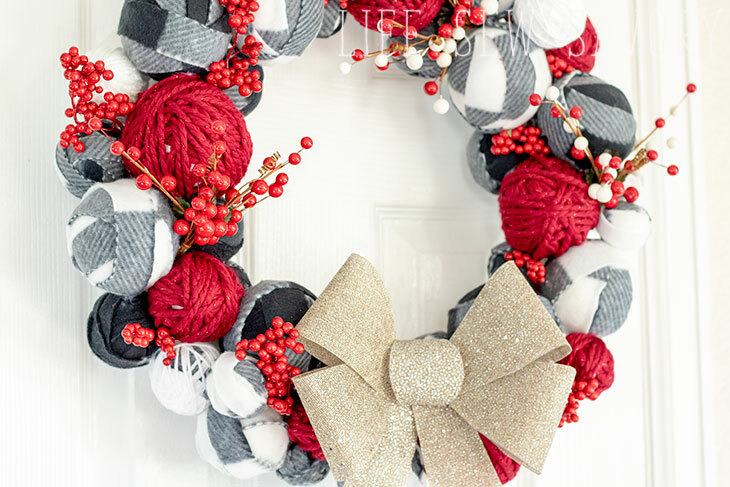 Thank you so much for linking to It’s Stinkin’ Cute Craft Thursdays! WOW – how cool is that. So fun! What an idea. It looks bright and colorful. link doesn’t work would love to use this to make my family a tree skirt !! cant ever find one i love . i want a sentimental tree skirt an i can use this pattern an woodland camo, an army camo an orange to make it a cute hunting tree skirt that would work for my family !!!! Hi! I just checked and the link worked fine! Please try again, and let me know if you can’t get it..
Did you cut the finished paper pieced unit 1/4″ bigger all around? 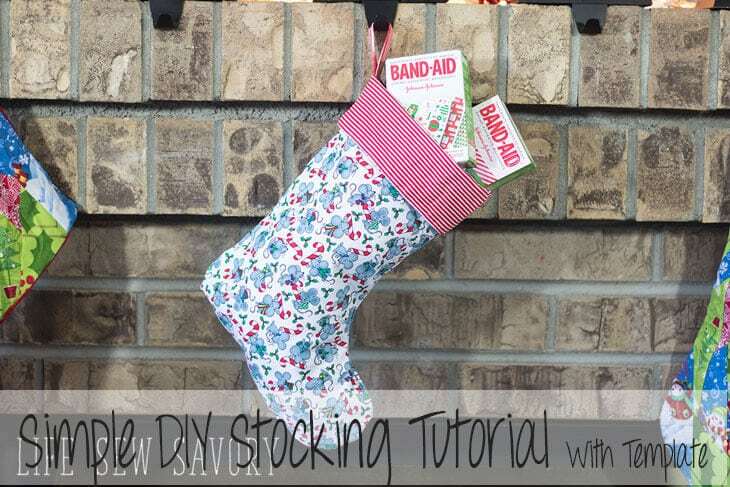 Then use 1/4″ seam to join all 12?